So you’ve been working out pretty consistently now for at least 6 weeks and you’ve seen some progress in your strength, fitness and maybe your body composition has even improved slightly – nice. But recently, you’ve shown little to no progress and so your motivation begins to wane. Your workout routine which you were so keen on before is getting bland and even boring. Time to change the workout routine and inject some new stimuli to the muscles, right? When our training plateaus, it’s easy to conclude that your exercise routine has reached its end of usefulness and it’s time to find a different routine to continue to challenge and stimulate the muscles for further growth. And in many cases, that might just be true, especially if your original workout routine was designed poorly and didn’t target the major muscle groups in your body or didn’t push you to a high enough intensity. 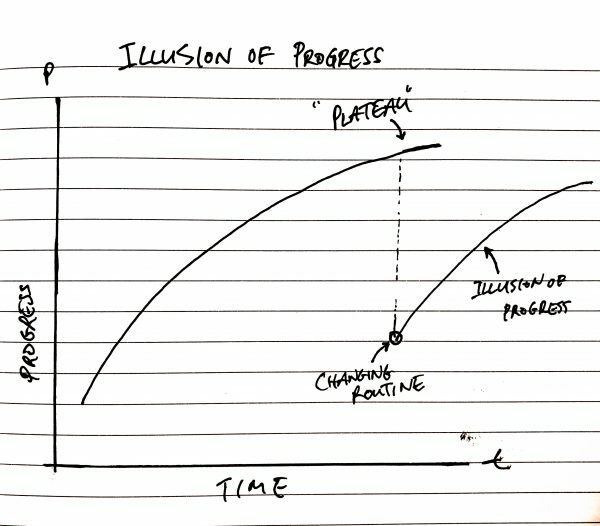 There are many reasons why your progress may plateau. Your frequency is too much (overtraining). If in fact your workout program is poorly designed, then you may need to switch to a better program (more on what constitutes a well-designed program later). Or if your fitness goals are more specific and requires further development of other muscles groups that weren’t covered or you’ve noticed an under-development of certain muscles groups, then yes, you may need to adjust your current workout routine to target those focus areas. But for the majority of the population with a very generic goal of to ‘lose fat and get fit’, and assuming your workout routine is a well-designed one, then constantly changing workout routines is actually doing you more a disservice. 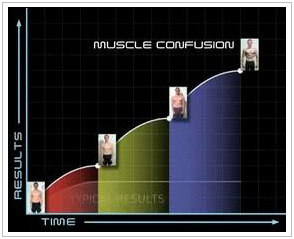 One common misconception is the belief that ‘muscle confusion’ is necessary in order to continue to stimulate the muscles for growth. 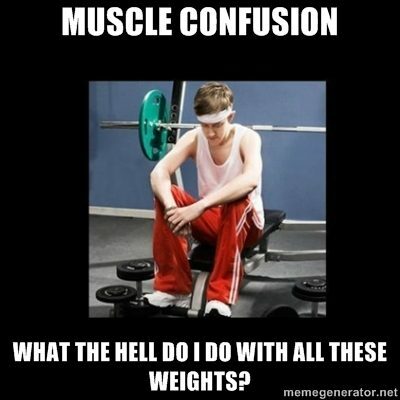 There are after all, lots of fitness videos and programs out there that advocate ‘muscle confusion’ is the way to sustain progress. But those claims are just plain false. If you have tried varying your routine and found that it has helped improve your strength and conditioning, consider the following argument. When you start a new routine or exercise, there are neural adaptations that have to take place for you to learn the new movement. For example, if you have been doing the bench chest press using dumbbells and then you decide to switch to the cable flies to work your chest, you will have to get accustomed to the new grip on the cable machine. You will have to learn the stance and engaging your core muscles so the stack of weights won’t pull you off your position. You will have to learn how to contract the pecs with a perhaps straighter arm in the elbow joint than what you were used to in the chest press movement. These changes all affect your nervous system and because of its unfamiliarity, results in less force produced in your chest muscles. However, you keep doing it for a few workouts and you start to get used to the movement. In other words, you have learned to be coordinated and efficient with the movement to start to produce more force and so you lift a heavier weight, thus giving you the impression that you’re making progress again. But don’t forget, that you may actually be producing 100 units of force when you were doing the bench chest press but when you switched over to the cable flies, that went down to 50 units of force as you started to learn the proper form and movement pattern for that new exercise. This gave you the sense of progress as you did in fact improve on doing the cable flies, but in terms of the actual benefit to your pectoralis major (chest muscle), it went down in intensity and resistance and after some time spent doing the cable flies it developed back up to maybe where you left off when you were doing the bench chest press. This illusion of progress did not improve your body composition, nor did it enhance your metabolic conditioning in any way from before, but at least you mastered a new technique for working out the chest! As shown in Figure 1, after changing routines or exercises and developing yourself back up, you are in fact no better off. Unfortunately, as we all get stronger and better conditioned, it is inevitable that gains will be harder to come by. Any little gain will come with a huge cost in effort. 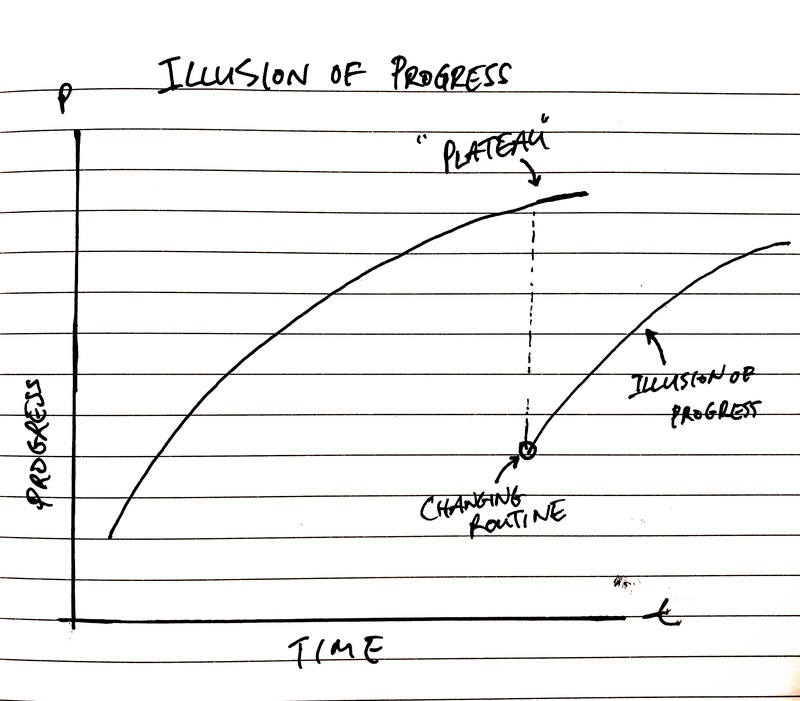 But by constantly changing routines and exercises, you will never be able to make incremental (albeit) small gains beyond your attention span. It is worth mentioning that there is nothing wrong for those who need to ‘keep things interesting’ for them to keep exercising, as we all get bored from time to time, but they should know and understand what a safe and effective exercise program should be to avoid wasting time, or worse, increasing the risk of injury.